Congratulations to Saint Matthew’s Episcopal Church in Fairbanks, Alaska, our newest Cool Congregation! Saint Matthew’s was nominated by Mary Walker, the Project Coordinator of Alaska IPL, for implementing a successful Carbon Fast during Lent last year. Conservation efforts come naturally to the members of Saint Matthew’s, an old log church nestled by a river in a picturesque landscape of summer flowers and winter snow. 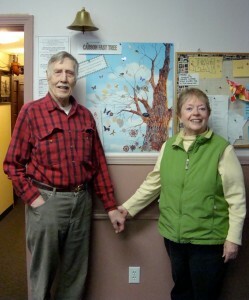 Many of Saint Matthew’s congregants are native Alaskans and have, as Andrea Backlund explains, an innate understanding of what it means to “live lightly on the land.” Backlund and her husband Oliver help coordinate the church’s creation care programs, efforts that Backlund describes as offering a theological context to actions many church members are already taking to care for the earth. Last year during Lent, twenty households at Saint Matthew’s participated in the church’s first Carbon Fast, a program modeled after a Lenten resource developed by North Carolina IPL. Participating families received informational packets containing weekly guides to thought, prayer, and action concerning global climate change. Pledge cards provided participants with specific ideas for cutting down on carbon emissions as well as information on the value of each action for the environment. The cards also included quotations from scripture highlighting the Christian responsibility to care for creation. Oliver and Andrea Backlund pose next to Saint Matthew's colorful tree, which they used to represent the church's progress throughout last year's Lenten Carbon Fast. Each Sunday, participants in the Carbon Fast signed and returned pledge cards to report their energy saving actions. The carbon savings were then tallied and reported to the congregation. The Backlunds also created a poster to serve as a visual representation of the church’s progress. The poster began as a bare tree, but with each pledge card submitted, the tree gained leaves, flowers, butterflies, bird’s nests, eggs, and birds. Each of these symbolized a certain amount of carbon emissions saved from the atmosphere. Over the course of six weeks, participants in Saint Matthew’s Carbon Fast saved or pledged a grand total of 50,000 pounds of carbon emissions, and the once-bare tree in the Parish Hall teemed with new life. The tree provided the congregation with a reminder of the importance of creation care. Participants in the program also gained a better understanding of the Christian responsibility to care for creation. Congratulations again to Saint Matthew’s Episcopal Church in Fairbanks, Alaska, for holding a Carbon Fast during the Lenten season that has earned Saint Matthew’s the title of a Cool Congregation. For more information about how your church can hold its own Lenten Carbon Fast this year, check out North Carolina IPL’s website [http://ncipl.org/content/publications/] to download their Lenten resource, and contact your state’s IPL [http://www.theregenerationproject.org/State.htm] for help getting started.